Congo basin September–November rainfall varies by up to a factor of 3 across CMIP5 coupled models. The severe lack of observational data in this region makes model evaluation difficult using standard techniques. This study uses a process-based assessment to evaluate the plausibility of mechanisms related to coupled model rainfall in September–November. Models tend to simulate a rainfall maximum in either the west or east of the basin. 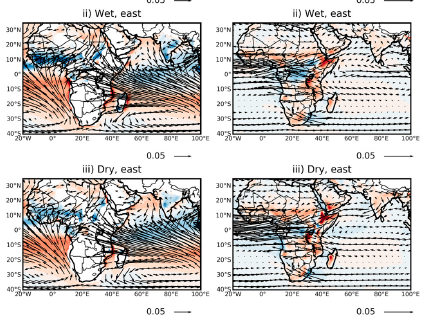 In most months, western Congo rainfall is positively correlated with eastern Congo rainfall across models, as relatively wet models are often wetter everywhere; however, in August – November this correlation becomes insignificant, suggesting that processes relating to rainfall differences in each subdomain are distinct. Composite analysis of wet and dry models in each subdomain suggests that the tropical eastern Atlantic SST bias helps differentiate between models in the west: wetter models tend to have a larger (;18–28C) and more equatorward SST bias, higher evaporation over the ocean, and higher local convection. In the east, rainfall differences between models are related to more remote SST differences, including cold South Atlantic and warm eastern Indian Ocean SSTs. Wetter models exhibit stronger westerly flow across the tropical eastern Atlantic, as part of an enhanced equatorial zonal overturning cell. Dry models in the east feature a stronger and more equatorward northerly component of the midlevel African easterly jet, which may contribute to suppressed convection over the domain. This assessment casts doubt on the credibility of models that are very wet in the west of the Congo basin and have a large Atlantic SST bias.